Price does not include Tax, Title, License, Documentation Fee. Dealer added accessories are extra. Customer may qualify for additional rebates, Prices may vary, see dealer for details. Rebate may require financing with GMF, OAC. $2,000 - General Motors Consumer Cash Program. Exp. 04/30/2019, $1,500 - GM Down Payment Assistance Program. Exp. 04/30/2019, $2,000 - GM Lease Loyalty Towards Purchase Private Offer. Exp. 04/30/2019 2018 Chevrolet Silverado 1500 LTZ 2LZ Cajun Red Tintcoat 8-Speed Automatic, 4WD, Jet Black Leather, 110-Volt AC Power Outlet, 150 Amp Alternator, 3.42 Rear Axle Ratio, 4.2" Diagonal Color Display Driver Info Center, 4-Wheel Disc Brakes, 6 Speaker Audio System, ABS brakes, Auto-Dimming Inside Rear-View Mirror, Auxiliary External Transmission Oil Cooler, Bluetooth? For Phone, Body Color Rear Bumper w/Cornersteps, Body-Color Grille Surround, Body-Color Headlamp Bezels, Chevrolet Connected Access, Chevrolet w/4G LTE, Chrome Bodyside Moldings, Chrome Cap Power-Adjustable Heated Outside Mirrors, Chrome Door Handles, Chrome Mirror Caps, Color-Keyed Carpeting w/Rubberized Vinyl Floor Mats, Deep-Tinted Glass, Driver & Front Passenger Illuminated Vanity Mirrors, Dual front impact airbags, Dual front side impact airbags, Dual-Zone Automatic Climate Control, Electric Rear-Window Defogger, Electronic Stability Control, Exterior Parking Camera Rear, EZ Lift & Lower Tailgate, Front & Rear Black Bowtie Emblems (LPO), Front Body-Color Bumper, Front Chrome Bumper, HD Radio, Heated Driver & Front Passenger Seats, Heavy-Duty Rear Locking Differential, Integrated Trailer Brake Controller, Leather Appointed Seat Trim, Leather Wrapped Heated Steering Wheel, Leather Wrapped Steering Wheel w/Cruise Controls, LED Cargo Box Lighting, LED Taillamps w/Signature, Low tire pressure warning, LTZ Plus Package, Manual Tilt/Telescoping Steering Column, Memory seat, Occupant sensing airbag, OnStar & Chevrolet Connected Services Capable, Overhead airbag, Power Adjustable Pedals, Power driver seat, Power Sliding Rear Window, Power steering, Power windows, Power Windows w/Driver Express Up, Preferred Equipment Group 2LZ, Radio: AM/FM 8" Diagonal Clr Touch Nav, Rear 60/40 Folding Bench Seat (Folds Up), Rear Chrome Bumper, Rear Wheelhouse Liners, Rear window defroster, Remote Keyless Entry, Remote Locking Tailgate, Remote Vehicle Starter System, Single Slot CD/MP3 Player, SiriusXM Satellite Radio, Spray-On Pickup Box Bed Liner, Steering Wheel Audio Controls, Steering wheel mounted audio controls, Theft Deterrent System (Unauthorized Entry), Thin Profile LED Fog Lamps, Traction control, Trailering Package, Universal Home Remote, Wheels: 20" x 9" Chrome.www.simivalleychevrolet.com Excellent selection of New and Used vehicles, Financing Options, Serving Simi Valley and the greater LA Area! Price does not include Tax, Title, License, Documentation Fee. Dealer added accessories are extra. Customer may qualify for additional rebates, Prices may vary, see dealer for details. Rebate may require financing with GMF, OAC. $1,500 - General Motors Consumer Cash Program. Exp. 04/30/2019, $1,500 - GM Down Payment Assistance Program. Exp. 04/30/2019, $2,000 - GM Lease Loyalty Towards Purchase Private Offer. Exp. 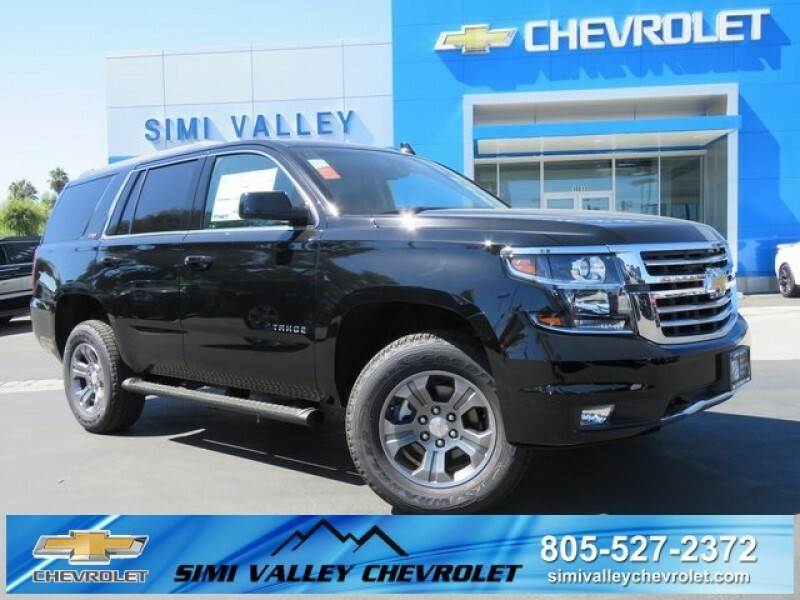 04/30/2019 2019 Chevrolet Tahoe LT Z71 Black 4WD, Jet Black Leather, 18" x 8.5" Aluminum Wheels, 1st & 2nd Row Color-Keyed Carpeted Floor Mats, 2 Front Frame-Mounted Black Recovery Hooks, 2nd Row 60/40 Split-Folding Manual Bench, 2nd Row Pwr Release 60/40 Split Folding Bench Seat, 3.42 Rear Axle Ratio, 3rd Row 60/40 Power Fold Split-Bench, 3rd Row Manual 60/40 Split-Folding Fold Flat Bench, 4-Wheel Antilock Disc Brakes w/Brake Assist, 5 12-Volt Auxiliary Power Outlets, Auto-Dimming Inside Rear-View Mirror, Automatic temperature control, Black Assist Steps, Black Tubular Assist Steps, Bluetooth? For Phone, Body Security Content Theft Protection Package, Bose Premium 9-Speaker System, Cargo Net, Color-Keyed Carpeting Floor Covering, Driver Inboard & Front Passenger Airbags, Dual front impact airbags, Dual front side impact airbags, Electronic Cruise Control w/Set & Resume Speed, Electronic Stability Control, Emergency communication system: OnStar and Chevrolet connected services capable, Enhanced Driver Alert Package (Y86), Extended-Range Remote Keyless Entry, Floor Console, Fog Lamps, Forward Collision Alert, Front & Rear Park Assist, Front dual zone A/C, Front Passenger 6-Way Power Seat Adjuster, Hands Free Power Liftgate, HD Radio, Heated 2nd Row Seats, Heated Leather Wrapped Steering Wheel, Hill Descent Control, IntelliBeam Headlamps, Lane Change Alert w/Side Blind Zone Alert, Lane Keep Assist w/Lane Departure Warning, Leather-Wrapped Steering Wheel, Low Speed Forward Automatic Braking, Low tire pressure warning, Luxury Package, Memory Settings, Occupant sensing airbag, Off-Road Z71 Suspension Package, Overhead airbag, Passive Entry System, Power Liftgate, Power Tilt & Telescopic Steering Column w/Memory, Power-Adjustable Accelerator & Brake Pedals, Power-Folding Heated Outside Mirrors, Preferred Equipment Group 1LT, Push Button Keyless Start, Radio: Chevrolet Infotainment AM/FM Stereo w/Nav, Rear air conditioning, Rear anti-roll bar, Rear Cross Traffic Alert, Rear Park Assist w/Audible Warning, Rear window defroster, Remote Vehicle Start, Roof-Mounted Luggage Rack Side Rails, Single-Slot CD/MP3 Player, SiriusXM NavTraffic, SiriusXM Radio, Theft-Deterrent Alarm System, Universal Home Remote, Vehicle Inclination Sensor, Vehicle Interior Movement Sensor.www.simivalleychevrolet.com Excellent selection of New and Used vehicles, Financing Options, Serving Simi Valley and the greater LA Area! Price does not include Tax, Title, License, Documentation Fee. Dealer added accessories are extra. Customer may qualify for additional rebates, Prices may vary, see dealer for details. Rebate may require financing with GMF, OAC. $2,000 - Silverado 1500 w/PDU/PEB Incremental Consumer Cash. Exp. 05/31/2019, $1,500 - GM Down Payment Assistance Program. Exp. 04/30/2019, $2,000 - Chevrolet Conquest Purchase Private Offer. Exp. 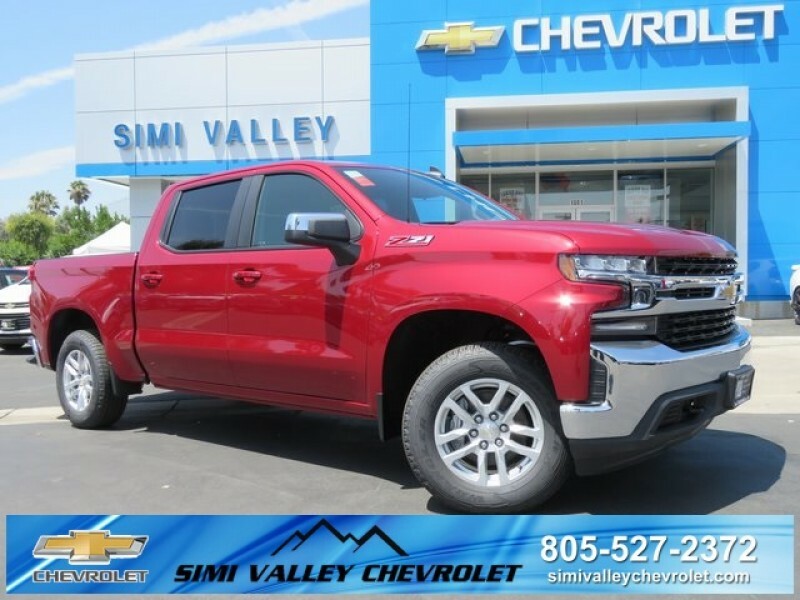 04/30/2019 2019 Chevrolet Silverado 1500 LT Cajun Red Tintcoat 8-Speed Automatic, 4WD, Black Cloth, 10-Way Power Driver Seat w/Lumbar, 12-Volt Rear Auxiliary Power Outlet, 2 USB Ports (First Row), 3.23 Rear Axle Ratio, 4.2" Diagonal Color Display Driver Info Center, 4-Way Manual Driver Seat Adjuster, 4-Wheel Disc Brakes, ABS brakes, All-Star Edition, All-Weather Floor Liner (LPO) (AAK), Bed Protection Package, Bluetooth? For Phone, Chevrolet Connected Access, Chevrolet w/4G LTE, Chevytec Spray-On Black Bedliner, Chrome Grille, Chrome Mirror Caps, Color-Keyed Carpeting Floor Covering, Compass, Convenience Package, Deep-Tinted Glass, Dual front impact airbags, Dual front side impact airbags, Dual-Zone Automatic Climate Control, Electric Rear-Window Defogger, Electrical Lock Control Steering Column, Electronic Cruise Control, Electronic Stability Control, Front anti-roll bar, Front Frame-Mounted Black Recovery Hooks, Front Rubberized Vinyl Floor Mats, Heated Driver & Front Passenger Seats, Heated Steering Wheel, Heavy-Duty Rear Locking Differential, Hitch Guidance, Integrated Trailer Brake Controller, Keyless Open & Start, Leather Wrapped Steering Wheel, LED Cargo Area Lighting, Locking Tailgate, Low tire pressure warning, Manual Tilt Wheel Steering Column, Manual Tilt/Telescoping Steering Column, Occupant sensing airbag, OnStar & Chevrolet Connected Services Capable, Overhead airbag, Power Door Locks, Power Front Windows w/Driver Express Up/Down, Power Front Windows w/Passenger Express Down, Power Rear Windows w/Express Down, Preferred Equipment Group 1LT, Rear 60/40 Folding Bench Seat (Folds Up), Rear Dual USB Charging-Only Ports, Rear Rubberized-Vinyl Floor Mats, Rear Vision Camera, Rear Wheelhouse Liners, Remote Keyless Entry, Remote Vehicle Starter System, Single-Zone Manual/Semi-Automatic Air Conditioning, Steering Wheel Audio Controls, Theft Deterrent System (Unauthorized Entry), Traction control, Trailering Package, Urethane Steering Wheel, Wheels: 18" x 8.5" Bright Silver Painted Aluminum, Z71 Off-Road & Protection Package.www.simivalleychevrolet.com Excellent selection of New and Used vehicles, Financing Options, Serving Simi Valley and the greater LA Area! Price does not include Tax, Title, License, Documentation Fee. Dealer added accessories are extra. Customer may qualify for additional rebates, Prices may vary, see dealer for details. Rebate may require financing with GMF, OAC. $3,000 - Chevrolet Loyalty Private Offer Program. Exp. 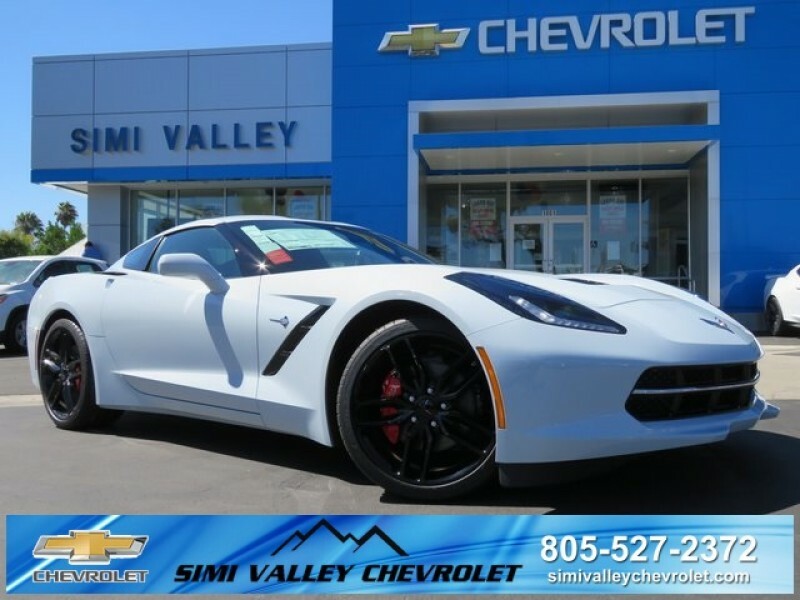 04/30/2019 2019 Chevrolet Corvette Stingray 1LT Ceramic Matrix Gray Metallic 4-Wheel Disc Brakes, ABS brakes, Air Conditioning, Battery Protection Package, Cargo Mat w/Stingray Logo (LPO), Dual front impact airbags, Dual front side impact airbags, Electronic Stability Control, Emergency communication system, Low tire pressure warning, Occupant sensing airbag, Performance Exhaust, Power driver seat, Power steering, Power windows, Preferred Equipment Group 1LT, Radio: Chevrolet Infotainment System, Rear anti-roll bar, Red-Painted Calipers, Remote keyless entry, Remote Vehicle Starter System, Steering wheel mounted audio controls, Traction control, Wheels: 19" x 8.5" Fr & 20" x 10" Rr Black-Painted.www.simivalleychevrolet.com Excellent selection of New and Used vehicles, Financing Options, Serving Simi Valley and the greater LA Area! Price does not include Tax, Title, License, Documentation Fee. Dealer added accessories are extra. Customer may qualify for additional rebates, Prices may vary, see dealer for details. Rebate may require financing with GMF, OAC. $1,500 - General Motors Consumer Cash Program. Exp. 04/30/2019, $1,500 - GM Down Payment Assistance Program. Exp. 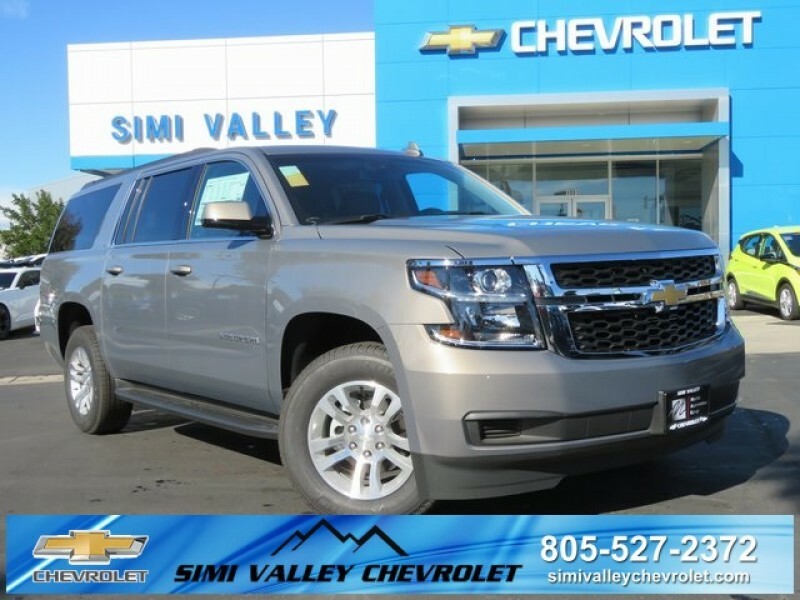 04/30/2019, $2,000 - GM Lease Loyalty Towards Purchase Private Offer. Exp. 04/30/2019 2019 Chevrolet Suburban LT Pepperdust Metallic 12-Volt Auxiliary Power Outlet (5), 1st & 2nd Row Color-Keyed Carpeted Floor Mats, 2nd Row 60/40 Split-Folding Manual Bench, 3.42 Rear Axle Ratio, 3rd Row Manual 60/40 Split-Folding Fold Flat Bench, 4-Wheel Antilock Disc Brakes, 6-Way Power Front Passenger Seat Adjuster, ABS brakes, Alloy wheels, Auto-Dimming Inside Rear-View Mirror, Black Assist Steps, Bose Premium Audio System Feature, Color-Keyed Carpeting Floor Covering, Compass, Driver Inboard & Front Passenger Airbags, Dual front impact airbags, Dual front side impact airbags, Electronic Cruise Control w/Set & Resume Speed, Electronic Stability Control, Emergency communication system: OnStar and Chevrolet connected services capable, Enhanced Driver Alert Package, Extended-Range Remote Keyless Entry, Floor Console w/Storage Area, Forward Collision Alert, Front dual zone A/C, HD Radio, Heated door mirrors, Heated Front Reclining Bucket Seats, Heated front seats, Illuminated entry, Integrated Trailer Brake Controller, IntelliBeam w/Automatic High Beam On/Off, Lane Keep Assist w/Lane Departure Warning, Leather-Wrapped Steering Wheel, Low Speed Forward Automatic Braking, Low tire pressure warning, Max Trailering Package, Memory Settings, Navigation System, Occupant sensing airbag, Overhead airbag, Power Liftgate, Power-Adjustable Accelerator & Brake Pedals, Preferred Equipment Group 1LT, Radio: AM/FM Stereo w/Chevrolet Infotainment, Rear anti-roll bar, Rear Park Assist w/Audible Warning, Remote keyless entry, Remote Vehicle Start, Roof-Mounted Luggage Rack Side Rails, Safety Alert Seat, Single-Slot CD/MP3 Player, SiriusXM Radio, Standard Suspension Package, Traction control, Universal Home Remote.www.simivalleychevrolet.com Excellent selection of New and Used vehicles, Financing Options, Serving Simi Valley and the greater LA Area! Price does not include Tax, Title, License, Documentation Fee. Dealer added accessories are extra. Customer may qualify for additional rebates, Prices may vary, see dealer for details. Rebate may require financing with GMF, OAC. $3,000 - Chevrolet Loyalty Private Offer Program. Exp. 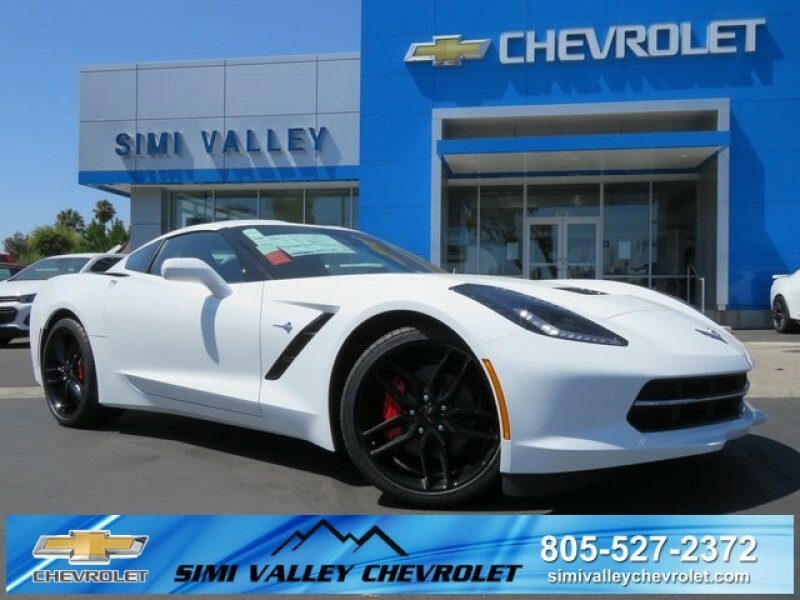 04/30/2019 2019 Chevrolet Corvette Stingray 1LT Arctic White 4-Wheel Disc Brakes, ABS brakes, Automatic temperature control, Battery Protection Package, Dual front impact airbags, Dual front side impact airbags, Electronic Stability Control, Emergency communication system, Exterior Parking Camera Rear, Low tire pressure warning, Occupant sensing airbag, Performance Exhaust, Power driver seat, Power steering, Power windows, Preferred Equipment Group 1LT, Radio: Chevrolet Infotainment System, Rear anti-roll bar, Red-Painted Calipers, Remote keyless entry, Remote Vehicle Starter System, Steering wheel mounted audio controls, Wheels: 19" x 8.5" Fr & 20" x 10" Rr Black-Painted.www.simivalleychevrolet.com Excellent selection of New and Used vehicles, Financing Options, Serving Simi Valley and the greater LA Area! Price does not include Tax, Title, License, Documentation Fee. Dealer added accessories are extra. Customer may qualify for additional rebates, Prices may vary, see dealer for details. Rebate may require financing with GMF, OAC. $1,500 - General Motors Consumer Cash Program. Exp. 04/30/2019, $1,500 - GM Down Payment Assistance Program. Exp. 04/30/2019, $2,000 - GM Lease Loyalty Towards Purchase Private Offer. Exp. 04/30/2019 2019 Chevrolet Suburban LT Iridescent Pearl Tricoat 12-Volt Auxiliary Power Outlet (5), 1st & 2nd Row Color-Keyed Carpeted Floor Mats, 2nd Row 60/40 Split-Folding Manual Bench, 2nd Row Pwr Release 60/40 Split Folding Bench Seat, 3.42 Rear Axle Ratio, 3rd Row 60/40 Power Fold Split-Bench, 3rd Row Manual 60/40 Split-Folding Fold Flat Bench, 4-Wheel Antilock Disc Brakes, 6-Way Power Front Passenger Seat Adjuster, ABS brakes, Auto-Dimming Inside Rear-View Mirror, Black Assist Steps, Bose Premium Audio System Feature, Bright Bodyside Moldings, Chrome Assist Step Kit (LPO), Chrome Recovery Hooks, Color-Keyed Carpeting Floor Covering, Compass, Driver Inboard & Front Passenger Airbags, Electronic Cruise Control w/Set & Resume Speed, Electronic Stability Control, Enhanced Driver Alert Package, Extended-Range Remote Keyless Entry, Floor Console w/Storage Area, Fog Lamps, Forward Collision Alert, Front & Rear Park Assist, Front dual zone A/C, Grille Insert (LPO), Hands-Free Power Liftgate, HD Radio, Heated 2nd Row Outboard Seats, Heated door mirrors, Heated Front Reclining Bucket Seats, Heated front seats, Heated Leather Wrapped Steering Wheel, Illuminated entry, Integrated Trailer Brake Controller, IntelliBeam w/Automatic High Beam On/Off, Lane Change Alert w/Side Blind Zone Alert, Lane Keep Assist w/Lane Departure Warning, Leather-Wrapped Steering Wheel, Low Speed Forward Automatic Braking, Low tire pressure warning, LT Signature Package, Luxury Package, Max Trailering Package, Memory Settings, Navigation System, Passive Entry System, Polished Exhaust Tip, Power Folding & Adjustable Heated Outside Mirrors, Power Liftgate, Power Tilt & Telescoping Steering Column, Power-Adjustable Accelerator & Brake Pedals, Preferred Equipment Group 1LT, Push Button Keyless Start, Rear Cross Traffic Alert, Rear Park Assist w/Audible Warning, Remote keyless entry, Remote Vehicle Start, Roof-Mounted Luggage Rack Side Rails, Safety Alert Seat, SiriusXM Radio, Standard Suspension Package, Traction control, Universal Home Remote, Wheels: 20" x 9" Chrome.www.simivalleychevrolet.com Excellent selection of New and Used vehicles, Financing Options, Serving Simi Valley and the greater LA Area! Price does not include Tax, Title, License, Documentation Fee. Dealer added accessories are extra. Customer may qualify for additional rebates, Prices may vary, see dealer for details. Rebate may require financing with GMF, OAC. $1,500 - General Motors Consumer Cash Program. Exp. 04/30/2019, $1,500 - GM Down Payment Assistance Program. Exp. 04/30/2019, $2,000 - GM Lease Loyalty Towards Purchase Private Offer. Exp. 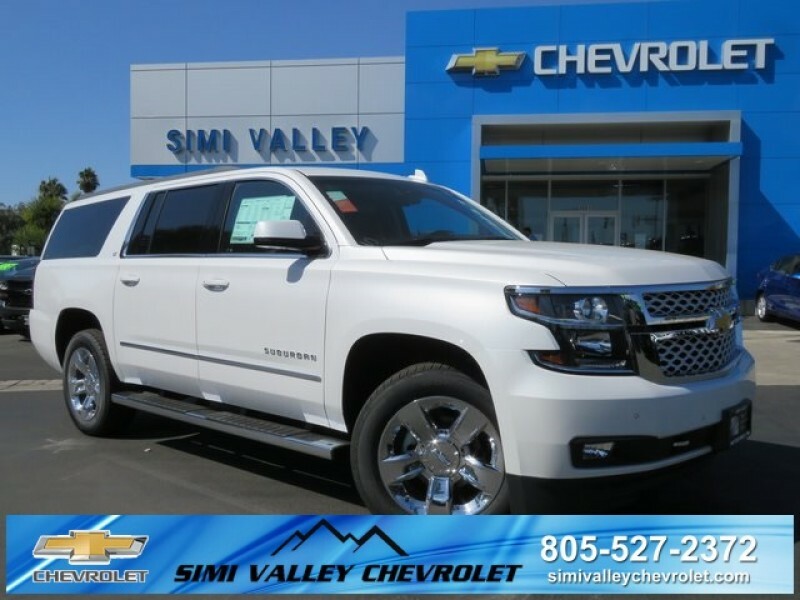 04/30/2019 2019 Chevrolet Suburban Premier Summit White 12-Volt Auxiliary Power Outlet (5), 1st & 2nd Row Color-Keyed Carpeted Floor Mats, 2-Speed Active Electronic AutoTrac Transfer Case, 3.42 Rear Axle Ratio, 3rd Row 60/40 Power Fold Split-Bench, 3rd Row DVD Screen, 4-Wheel Antilock Disc Brakes, 6-Way Power Front Passenger Seat Adjuster, ABS brakes, AM/FM Stereo w/Navigation, Auto-Dimming Inside Rear-View Mirror, Black Assist Steps, Body Security Content Theft-Protection Package, Color-Keyed Carpeting Floor Covering, Compass, Driver Inboard & Front Passenger Airbags, Dual front impact airbags, Dual front side impact airbags, Electronic Cruise Control w/Set & Resume Speed, Electronic Stability Control, Emergency communication system: OnStar and Chevrolet connected services capable, Enhanced Driver Alert Package, Exterior Parking Camera Rear, Floor Console w/Storage Area, Fog Lamps, Forward Collision Alert, Front & Rear Park Assist, Front anti-roll bar, Front Console Organizer Storage Bin (LPO), Front dual zone A/C, Hands-Free Power Liftgate, HD Radio, Heated 2nd Row Outboard Seats, Heated door mirrors, Heated front seats, Heated Leather Wrapped Steering Wheel, Heated rear seats, Illuminated entry, Integrated Trailer Brake Controller, IntelliBeam w/Automatic High Beam On/Off, Lane Change Alert w/Side Blind Zone Alert, Lane Keep Assist w/Lane Departure Warning, Low Speed Forward Automatic Braking, Low tire pressure warning, Max Trailering Package, Memory Settings, Occupant sensing airbag, Overhead airbag, Passive Entry System, Polished Exhaust Tip, Power Folding & Adjustable Heated Outside Mirrors, Power Liftgate, Power Release 2nd Row Bucket Seats, Power steering, Power Tilt & Telescoping Steering Column, Power Tilt-Sliding Sunroof w/Express-Open/Close, Power windows, Power-Adjustable Accelerator & Brake Pedals, Power-Retractable Assist Steps, Preferred Equipment Group 1LZ, Push Button Keyless Start, Rear Cross Traffic Alert, Rear Seat Entertainment System, Remote keyless entry, Remote Vehicle Start, Roof-Mounted Luggage Rack Side Rails, Safety Alert Seat, SiriusXM Radio, Steering wheel mounted audio controls, Sun, Entertainment & Destinations Package, Theft-Deterrent Alarm System, Traction control, Universal Home Remote, Vehicle Inclination Sensor, Vehicle Interior Movement Sensor, Wheels: 22" x 9" Gloss Black Aluminum, Wireless Charging.www.simivalleychevrolet.com Excellent selection of New and Used vehicles, Financing Options, Serving Simi Valley and the greater LA Area! Price does not include Tax, Title, License, Documentation Fee. Dealer added accessories are extra. Customer may qualify for additional rebates, Prices may vary, see dealer for details. Rebate may require financing with GMF, OAC. $1,500 - General Motors Consumer Cash Program. Exp. 04/30/2019, $1,500 - GM Down Payment Assistance Program. Exp. 04/30/2019, $2,000 - GM Lease Loyalty Towards Purchase Private Offer. Exp. 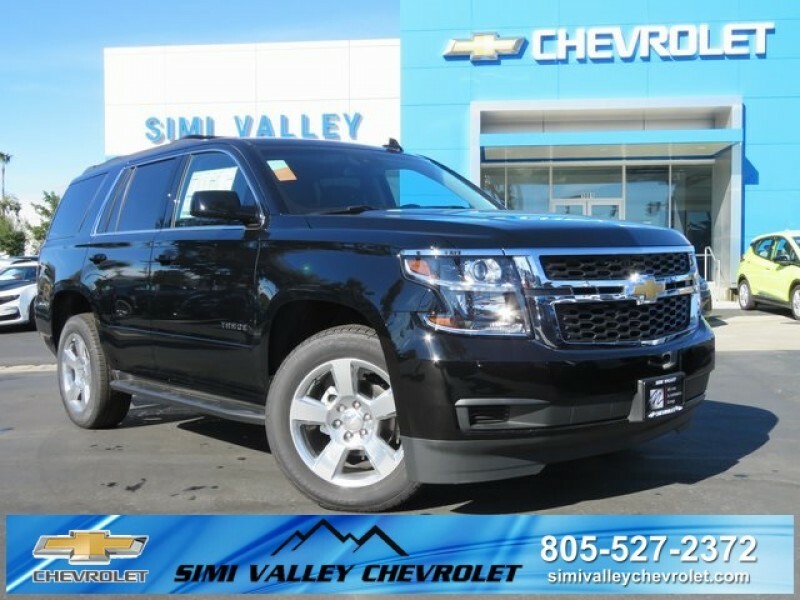 04/30/2019 2019 Chevrolet Tahoe LS Black Black Cloth, 1st & 2nd Row Color-Keyed Carpeted Floor Mats, 2nd Row 60/40 Split-Folding Manual Bench, 3.42 Rear Axle Ratio, 3rd Row Manual 60/40 Split-Folding Fold Flat Bench, 4-Wheel Antilock Disc Brakes w/Brake Assist, 5 12-Volt Auxiliary Power Outlets, ABS brakes, Air Conditioning, All-Season Package, All-Weather Floor Mats, All-Weather Rear Cargo Mat (LPO), Black Assist Steps, Black Roof Rack Cross Rails, Body-Color Bodyside Moldings, Cargo Net, Color-Keyed Carpeting Floor Covering, Compass, Driver Inboard & Front Passenger Airbags, Dual front impact airbags, Dual front side impact airbags, Electronic Cruise Control w/Set & Resume Speed, Electronic Stability Control, Emergency communication system: OnStar and Chevrolet connected services capable, Enhanced Driver Alert Package, Enhanced Driver Alert Package (Y86), Extended-Range Remote Keyless Entry, Exterior Parking Camera Rear, Forward Collision Alert, Front dual zone A/C, Front Passenger 6-Way Power Seat Adjuster, Heated door mirrors, Illuminated entry, Integrated Trailer Brake Controller, IntelliBeam Headlamps, Lane Keep Assist w/Lane Departure Warning, Leather-Wrapped Steering Wheel, Low Speed Forward Automatic Braking, Low tire pressure warning, Max Trailering Package, Occupant sensing airbag, Overhead airbag, Power steering, Power windows, Power-Adjustable Accelerator & Brake Pedals, Preferred Equipment Group 1LS, Rear air conditioning, Rear anti-roll bar, Rear Park Assist w/Audible Warning, Rear window defroster, Remote keyless entry, Remote Vehicle Start, Roof-Mounted Luggage Rack Side Rails, SiriusXM Radio, Standard Suspension Package, Steering wheel mounted audio controls, Traction control, Wheels: 20" x 9" Polished-Aluminum.www.simivalleychevrolet.com Excellent selection of New and Used vehicles, Financing Options, Serving Simi Valley and the greater LA Area! Price does not include Tax, Title, License, Documentation Fee. Dealer added accessories are extra. Customer may qualify for additional rebates, Prices may vary, see dealer for details. Rebate may require financing with GMF, OAC. $2,500 - General Motors Consumer Cash Program. Exp. 04/30/2019, $750 - GM Down Payment Assistance Program. Exp. 04/30/2019, $2,000 - GM Lease Loyalty Towards Purchase Private Offer. Exp. 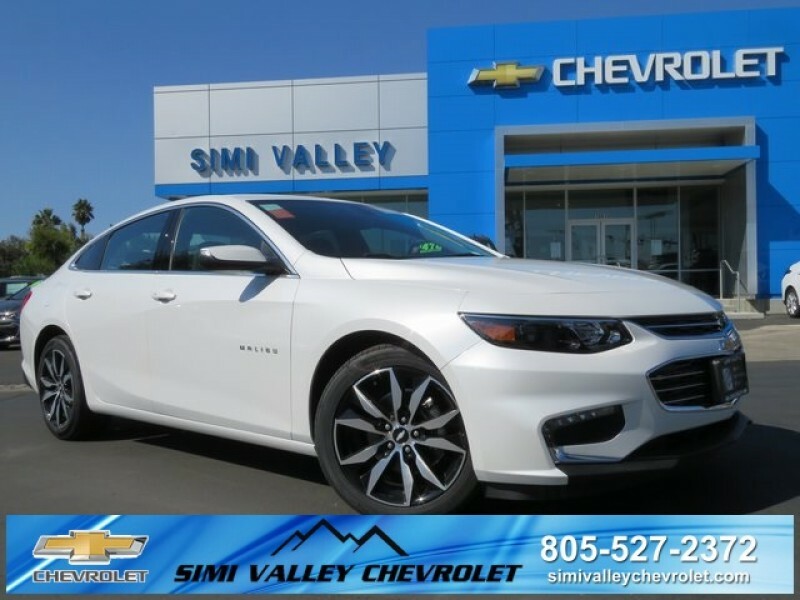 04/30/2019 2018 Chevrolet Malibu LT 1LT Iridescent Pearl Tricoat Jet Black Cloth, 120-Volt Power Outlet, 18" Aluminum Wheels, 4-Wheel Disc Brakes, 6-Speaker Audio System Feature, 8-Way Power Driver Seat Adjuster, ABS brakes, Cargo Mat, Convenience & Technology Package, Driver Information System w/Color Display, Dual front impact airbags, Dual front side impact airbags, Dual USB Charging-Only Ports, Electronic Stability Control, Emergency communication system: OnStar and Chevrolet connected services capable, Inside Rear-View Auto-Dimming Mirror, Knee airbag, Leather-Wrapped Shift Knob, Low tire pressure warning, Occupant sensing airbag, Overhead airbag, Power steering, Power windows, Preferred Equipment Group 1LT, Radio: Chevrolet MyLink AM/FM Stereo w/8" Screen, Rear anti-roll bar, Rear side impact airbag, Remote keyless entry, Remote Vehicle Starter System, SiriusXM Satellite Radio, Steering wheel mounted audio controls, Traction control, Wireless Charging For Devices. 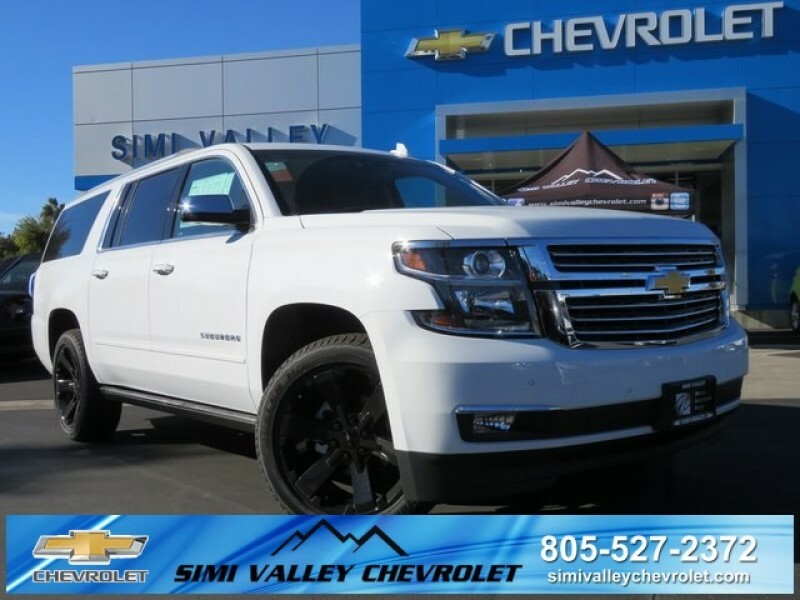 27/36 City/Highway MPGwww.simivalleychevrolet.com Excellent selection of New and Used vehicles, Financing Options, Serving Simi Valley and the greater LA Area!